Navigation is built in Cascade using the assets contained within the Base Folder. The Base Folder in Cascade 8 inherits the Site Title assigned during the site creation process, so it will no longer be called Base Folder. The site navigation is generated using the Display Names of folders and files housed within the site. 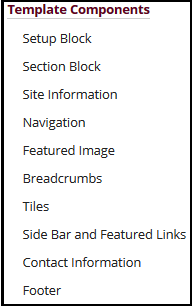 A select few folders do not display in the navigation structure by default, including the _cms, _config, css, images, documents, and stories folder. Each folder needs a page with the System Name of “default” inside in order for the navigation to function correctly. Sites will feature a Top Navigation that is consistently displayed on all pages of the website. These links represent the main sections and content of the site. As a rule of thumb, users want to make easy decisions so the Web Team recommends a maximum of 5-7 items in the Top Navigation. However, this may vary based on the length of the text for each of the navigation items. Additionally, sites will feature a Left Navigation that lists out the pages of the folder the user is currently viewing. This feature helps the user “drill-down” to the information they are interested in regardless of the depth content. The Navigation also has a handful of documented display options.